Dedicated to moonescape: She has been my best friend at MT since I got here, and has always helped me when I needed it. I also look up to her as a very talented artist. Lately she seems to be kind of down, and I can relate to that, so I hope this vector will cheer her up a bit. Moon-chan, for you ^_^. The vector wasn't so easy. Now I know why everyone let me vector her; no one wanted to do Lacus's clothes! Lol, just kidding. But it really did drive me crazy, all the little folds and lines on her outfit...grr. Oh well, it's done now. What annoys me though is that, again, when I save it as a jpeg the colours all change, and I hate it, but I don't know how to fix it (anyone?). But in the .psd file it looked perfect, you can see it here. I'll admit I felt the pressure with this vector ^_^;. I felt rushed to finish it, but I didn't want to do a bad job. I'm jealous of all you people with Illustrator now...I always hear, "It's faster, easier, straighter, better"...but I don't have it :(. Oh well, no need to rush anything else. [EDIT2] Hey, I was able to fix the colours a bit! Yay! It looks better now! that's a nice vector, the shades look good, and so do the lines. Love the way you have done with the hair! The design on the dress is beautiful! 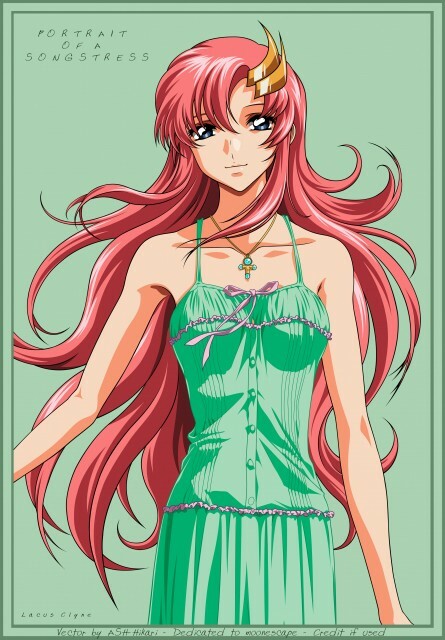 Love it Lacus is sooooooooooo beautiful. Thanks for sharing. Love it. Love it. Love it. Very Nicely Done! Everything Looks Goods and Clean! Lacus Looks so Beautiful as Always! XD Thanks A Lot For Sharing This Vector! Definitely Added to Fav! Pretty Lacus vector! Can't wait to see more. lacus is beautiful! great job on the vector!